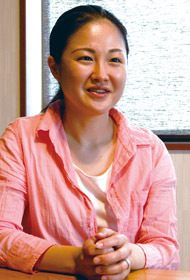 Reimi Takada, living in Kasuga city, Fukuoka prefecture (35 years old) / She is taking Royal Jelly for 4 years. I got married in 2 years ago and I was given my daughter 6 month later after marriage. Now she is 10 months old. My daughter has silky skin and she’s never got any illness. My friends are surprised when they see her because she seems growing very fast and healthy. I believe that this is because me and her taking Royal Jelly. When I was pregnant, I was taking supplements from Esprits, includes Royal Jelly, Calcium, Vitamin C, during pregnancy to keep my health better. And after her birth, I feed a baby milk and food with those supplements to her. I was curious that Royal Jelly from other companies have a good effects as same as Esprits’ or not, but I didn’t feel any effects to me when I tried others. Esprits’ Royal Jelly always makes me lighter in body and I can recover from fatigue quickly when I take. It is quite different from others. I don’t spare my money on Royal Jelly for keep it in stock. Because Being healthy makes my life well-off and if I lose my health, I can not use my money and time. You know, which is the WASTE? I recommend women especially who wants to keep a balance of work and parenting to take Royal Jelly. If you want to have a baby, Royal Jell makes you healthy and reduce the burden of pregnancy.